When you chargeback on any server you increase your "risk threshold". This means that, depending on a server's risk threshold you may not be able to purchase from a server. To be able to make a purchase you must settle your chargebacks on the server(s) you have charged back on. If you have charged back on Cosmic, you'll have to email [email protected]. 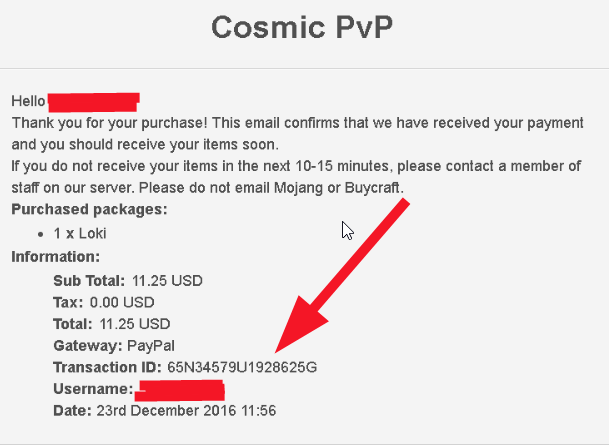 When you make a purchase on Cosmic you will receive a receipt from both Poofless and PayPal via email to the email provided when you check out through PayPal. Most computers are capable of taking a screenshot using the "Prtsc" button on your keyboard or by using a screenshot program that uploads the picture automatically. You can use a program such as Lightshot or Gyazo to select a section of your screen to take a screen shot. NOTE: In Lightshot you are able to edit the photo right there on your screen whereas Gyazo will take a raw picture and may prevent you from removing your personal information.